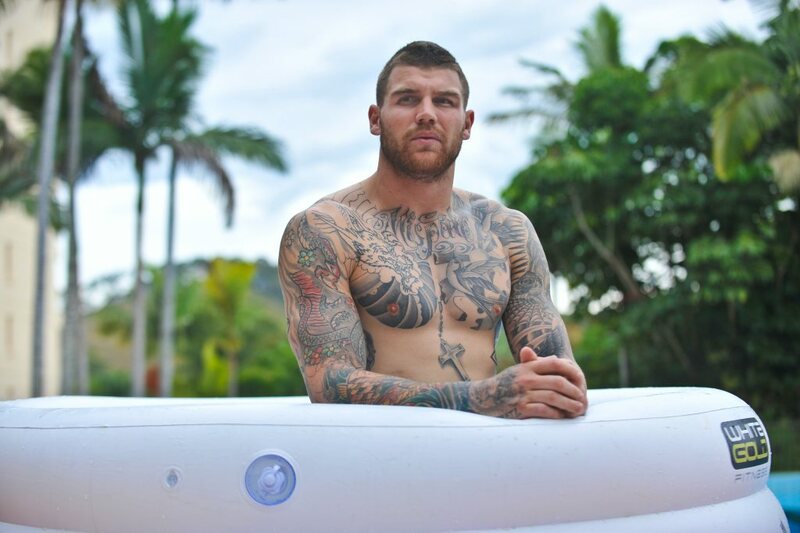 STANDING proud in sky blue, Josh Dugan is out to prove his rugby league redemption. Cast out by his hometown club the Canberra Raiders 12 months ago after a series of off-field incidents, he faced the prospect of becoming one of the game's lost talents. Granted a lifeline with the St George Illawarra Dragons and repositioned in the centres, Dugan's Blues call-up was "a decision backed by experience and form", according to coach Laurie Daley. Speaking in Coffs Harbour of his will to take the chance with two hands, Dugan appeared unfazed by the task of facing off against Greg Inglis in the centres in State of Origin Game II in Sydney tonight. "GI is definitely one of the best centres in the game, if not the best. It's going to be tough for me but I'm up for it," Dugan said. The 24-year-old has been a standout in his four previous appearances for New South Wales at fullback and after running in a hat-trick in the Dragons' recent win over Cronulla, the man who has his life story inked across his body, says he's raring to go. "Getting the chance to be part of the side that stopped Queensland's run would be the best moment of my career and I just hope I don't let anyone down," he said. Dugan's move to the centres was initiated by Daley and the Dragons' new coach, Paul McGregor. Remembered as a hard-running Origin great himself, "Mary" McGregor, as a member of the Blues coaching staff hopes Dugan's shift into the centres will prove a game-changing Origin masterstroke tonight. "What he brings is 102kg of talent," McGregor said. "He likes the physical contact in defence and he is a footballer so he knows where to position himself with the ball and he knows how to play off halves. "He likes the big stages. "If you look at his past history, every time he has played in Origin he has performed, so I think he will handle it."